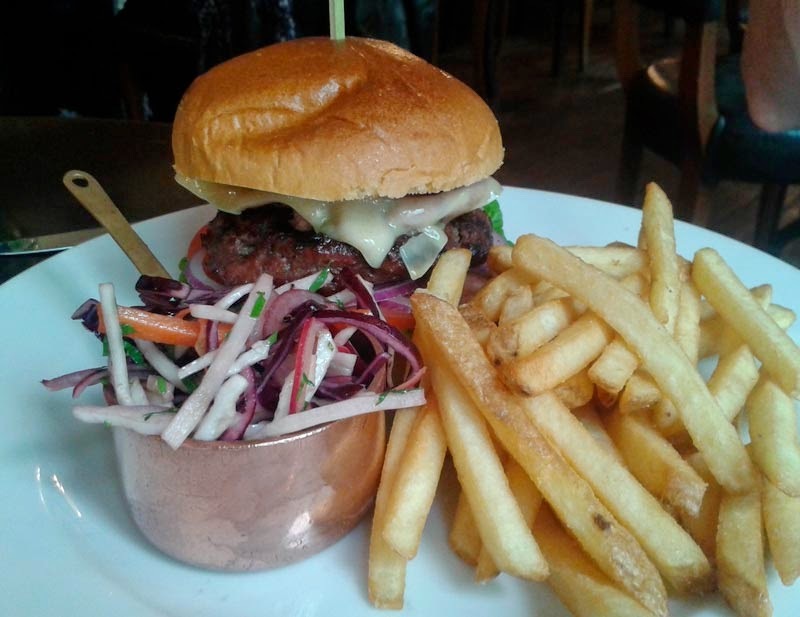 Home » brighton » burger » restaurant » review » REVIEW: Hotel Du Vin, Brighton. Al fresco dining. 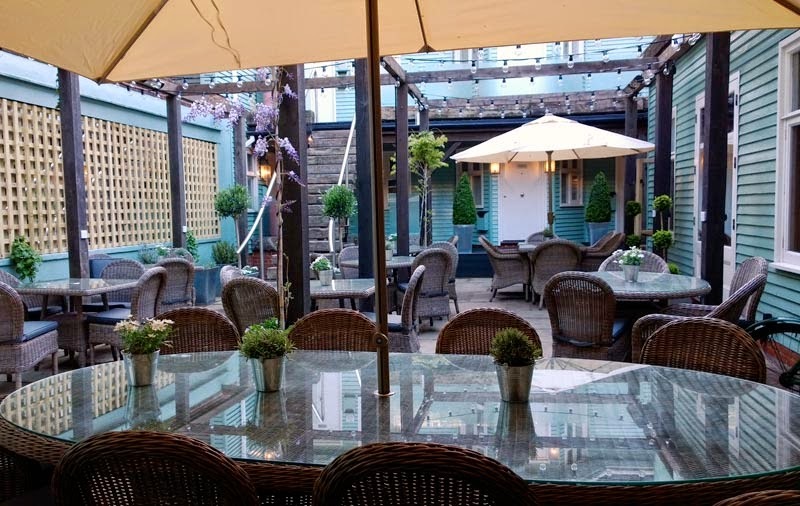 REVIEW: Hotel Du Vin, Brighton. Al fresco dining. I suppose it was only typical that on the day we came to Hotel Du Vin to dine from their new al fresco menu it was one of the coldest and windiest days we've had recently. So, wrapped up in our scarves, we glumly passed by the new beautifully renovated terraces, which would be perfect for lingering, lazy summer lunches and dinners. Brighton is quite limited on nice outside dining spaces so this is one to keep in mind. Although we had to decamp to the main restaurant, being the troopers we are we dismissed the offer of the a la carte menu with warming food and powered on with the streamlined Summer menu. As you can imagine it lists salads, cold soups and lighter, fresher meat and fish dishes. I also like the punch bowl options and that they have pulled out a selection of their wines suited to the food, including a chilled red wine section. This is not something you normally see here but we do it a lot in Italy in the Summer, sometimes sticking bottles into cold running mountain streams on picnics. 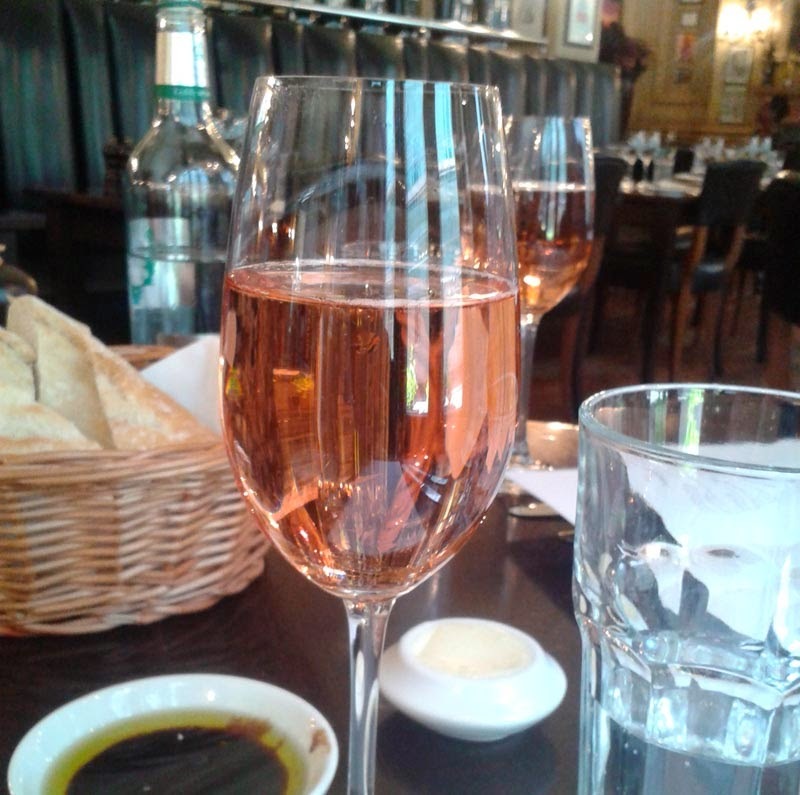 On the subject of wine, we started with a glass of crisp and fruity Wiston Estate sparing Rosé. I adore Sussex sparkling wines, but this was my first taste from the Wiston Estate, a new vineyard planted in 2006. And the packaging label has an awesome story behind it too if you're a brand geek like me. Definitely hunt these wines down, after my taste of the rosé I want to tick some of their others off the list too. 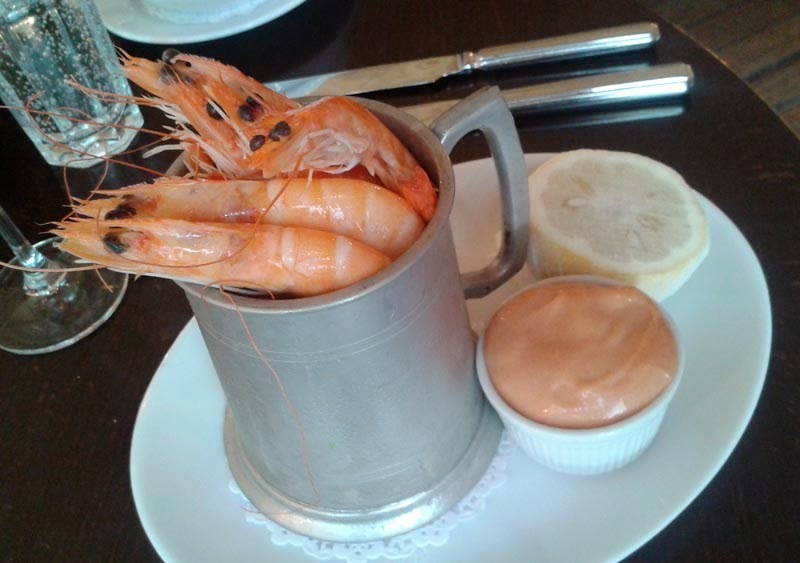 Mr GF's pint, or tankard, of prawns seemed pricey at £9.50 on the menu but was actually a very generous portion of plump, fresh and juicy prawns, perfect for dipping into the marie rose sauce. I always appreciate a muslin wrapped lemon too, a detail that makes a simple dish like this seem even more special. 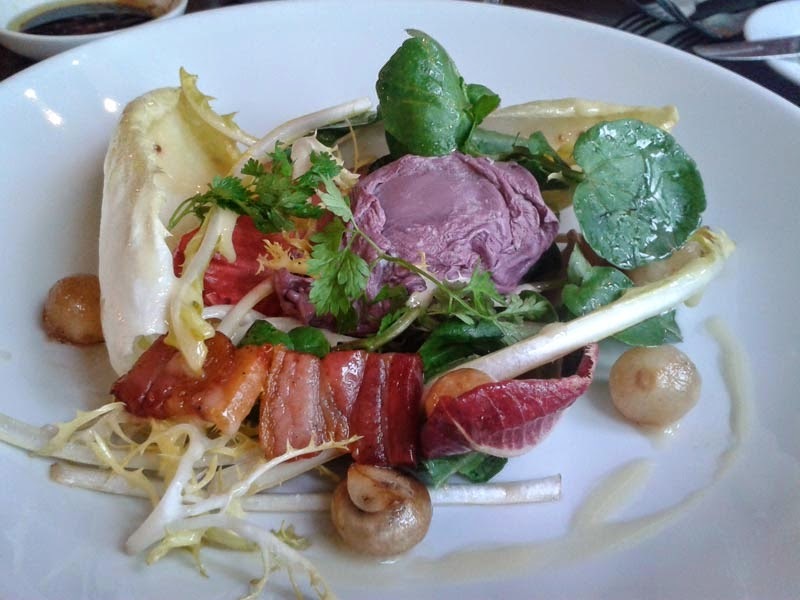 My Oeuf Ee Meurette Salad had some my favourite things; varieties of chicory, tiny button mushrooms, little silverskin onions and for once, lardons cooked exactly as I like them, crisp to melt away the flabby white fat, yet nothing to worry my dentist. The wine poached egg was the only disappointment, being incredibly bitter. Not sure if this was the wine variety used or maybe that restaurant poached eggs are often halted in cold water which may have affected the wine. Shame as it really reminded me of the style of salads I've had in Lyon to get me in the holiday mood. To accompany the food we asked the sommelier for their wine recommendation. I've become a big fan of asking their advice, mainly as I don't want to read hefty wine lists or choose wine based on the name alone (or what I can pronounce!). So many people are awkward about asking for wine recommendations, probably worried about a scenario like the recent table of diners in a London restaurant that were unknowingly drinking £400 bottles of wine until the bill with four of them came in. I've only ever had positive experiences, discreetly shown the price and rarely end up drinking something I don't like. Ziggy Grinbergs, head Sommelier at HDV Brighton, chose us some great wines and explained the choices, plus what red wines are suitable for chilling. The chilled Santa Barbara Country Pinot Noir by Byron Estate was ideal with Mr GF's burger which came...on a plate. Not a board, not a slate, not a dusty scaffolding plank but a plate! I almost wept happy tears. The burger itself came cooked through with no other option which was a shame but the patty was well flavoured and seasoned. The brioche bun was excellent in texture and sweetness, holding together throughout eating. 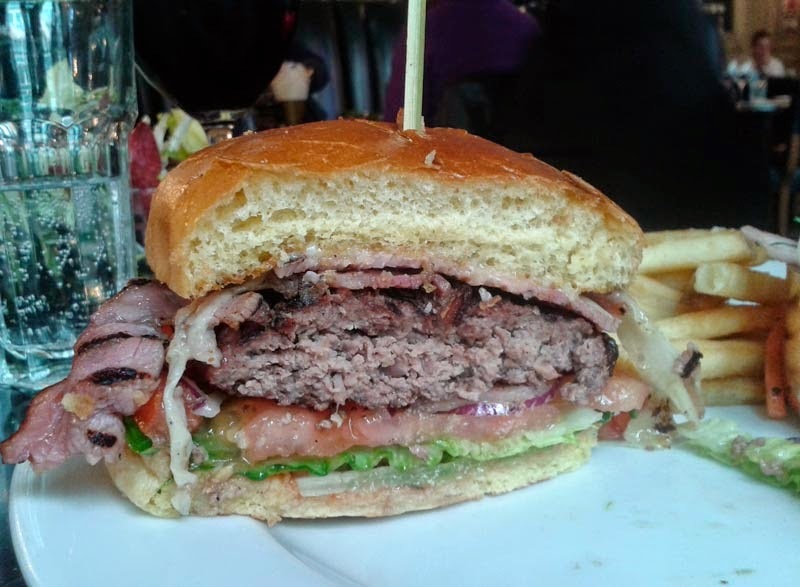 The charry smoke from the bacon gave it that BBQ summer edge and it was a darn fine burger. I know the fashion is for these sloppy, grease dripping burgers, but this is perfect for a man like mine that wears decent Grensons if you know what I mean. Frites were nice and crisp and the crunchy side salad nicely considered. 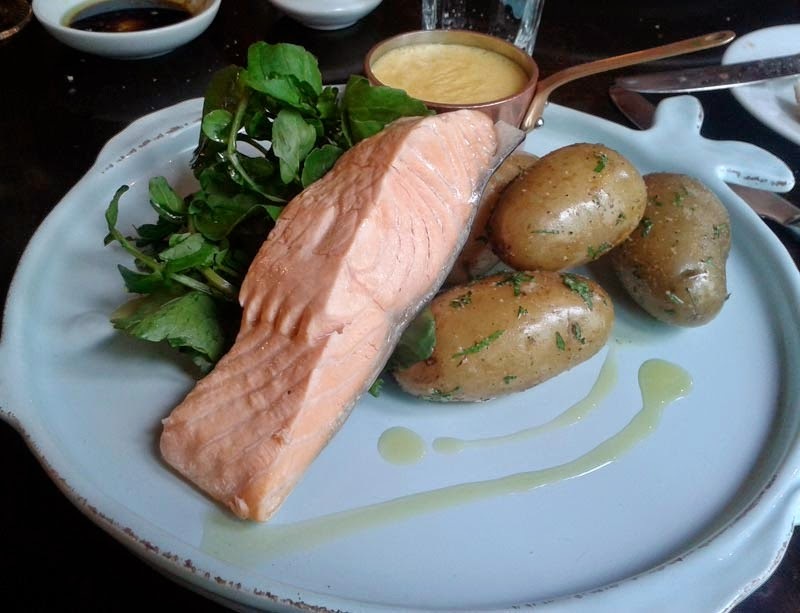 My classic salmon main with silky hollandaise is exactly what I want to eat on a hot day. Good quality, simple food which is well cooked. The plate, which you can just make out, was a nice fun touch as well. We finished up with a summer essential of sorbets and ice cream and both said how much we enjoyed our meal, which no doubt would have tasted even better in the fresh air. 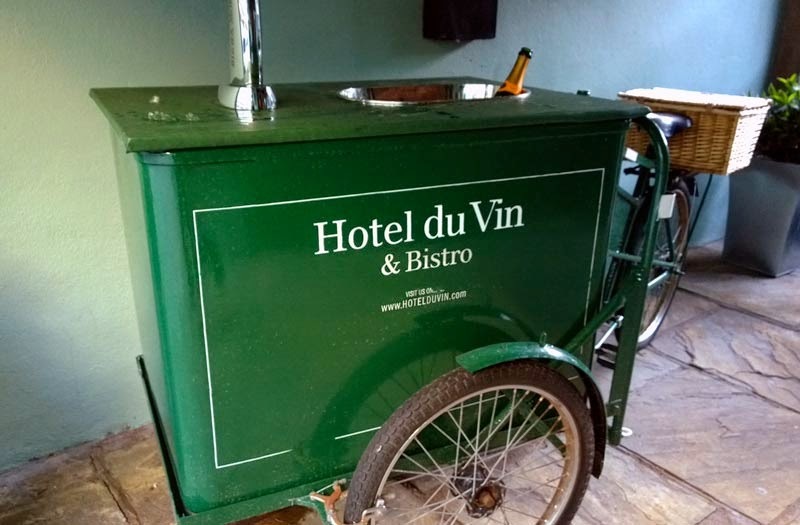 I had fallen out of love with Hotel Du Vin in recent years, it used to be excellent, we even celebrated our engagement here many moons ago, but thought the standard had begun to slip on the last of my visits. Today, the bar and bistro seem buzzy again and with ideas like this new menu and their eye on details like the exterior, I think they are back on track with creating the quality experience we've come to expect from them.